I’ve never had any special affinity for Recondo. I never had him growing up so I don’t have any real memories of him and by the time Pursuit of Cobra Recondo came out, I’d only had the Assault on Cobra Island Recondo for a short time and he really hadn’t made an impression on me. Honestly, the strongest memory I have of Recondo is tied to how DDP used him in America’s Elite. I don’t want to risk spoiling the story for those who haven’t read it, but I liked the personal bond he developed with Sparks and I thought they did a great job with him there. Unfortunately, that’s a part of Joe history that has kind of been swept under the rug. I know the DDP years, especially America’s Elite, we’re everybody’s cup of tea, but I really enjoyed them and I think they did some good things while they were experimenting with the Joe brand in comic form. Tangent about the comics aside, though, Pursuit of Cobra Recondo has definitely made an impression. It’s not the Recondo everyone grew up with, but it’s still a great take on the Joe team’s premiere jungle fighter. I’m a little surprised he wasn’t in the first wave of Pursuit of Cobra figures, but I’m glad Hasbro took its time and gave us a great Recondo a wave in as opposed to rushing him. A lot of time, effort and care went into this figure for the most part and it really shows. Like most of the early Pursuit of Cobra figures, Recondo’s made of all new molds and he really does look like he belongs out in the jungle on a prolonged mission. I’ll address this right away. Recondo’s torso has one glaring problem. He can’t really look up. If you tweak his upper body up a bit further than natural you can get him to look like he’s not staring at his shoes, but it’s kind of hard to pull that off with his vest on. As much as I’m a Hasbro backer, I also have to admit that they really dropped the ball on this. I’m kind of surprised Recondo made it through the entire design process, what with two-ups and other various prototyping, without this getting caught. 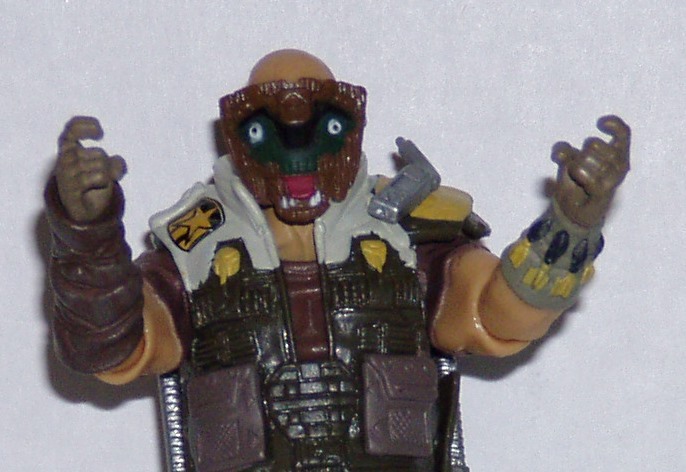 It was a big goof on their part and Hasbro does probably deserve the criticism it’s gotten for Recondo’s neck. 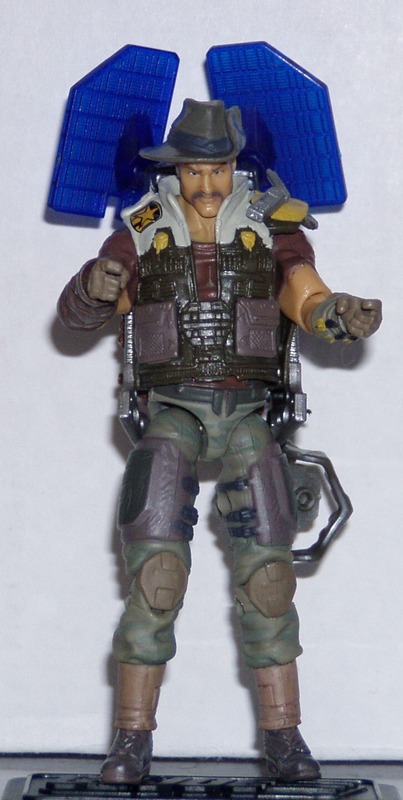 Neck issues aside, though, Hasbro came up with a great redesign of the Joe team’s premiere jungle specialist. Recondo’s a bit beefier than his traditional look, but I’m okay with that. To me, Pursuit of Cobra was a bit more about new beginnings for most of the Joe line. I don’t mind nods to the Joe line’s past, but I liked that the designers weren’t so hidebound to recreate everything the way it was. Recondo’s got stout legs that look very appropriate for a jungle trooper. I also really like the strapped on armor plates for his thighs. I’d imagine those would be nice to have running through the jungle. They might be a little cumbersome, but they could also prevent you from hurting yourself on a tree limb you didn’t see. His torso is a basic tight short-sleeved shirt with a pair of suspenders. I don’t recall a lot of Joes that wear suspenders and I find myself liking them for some reason. They’re unusual and I like seeing that here. Of course, you’re probably not going to see much of the suspenders because it’s covered with a great vest. It’s very detailed with a lot of appropriate pockets and some armored plates. Again, it’s a stylistic tie to Rise of Cobra and that’s fine with me. On his left shoulder, he’s also got a satellite phone attached in such a way that it would be simple for him to give orders into it just by turning his head. It’s not as fancy as Bluetooth, but it’s also a lot more field functional. His forearms have cloth wrappings, again something I’d assume would be useful in jungle trekking situations to protect them from a stray thorny protrusion. His left forearm wrap also has six darts sculpted into it. It’s an interesting choice and gives Recondo a bit more of a jungle hunter vibe. I can see him having picked up some skills with a blowgun from the Tucaros and adapting it to either food procurement in the field or for silent sentry elimination (though unfortunately he doesn’t have one in his accessory kit). Either way, it’s a nice little detail that fits Recondo perfectly. However, his head sculpt does leave a little to be desired. 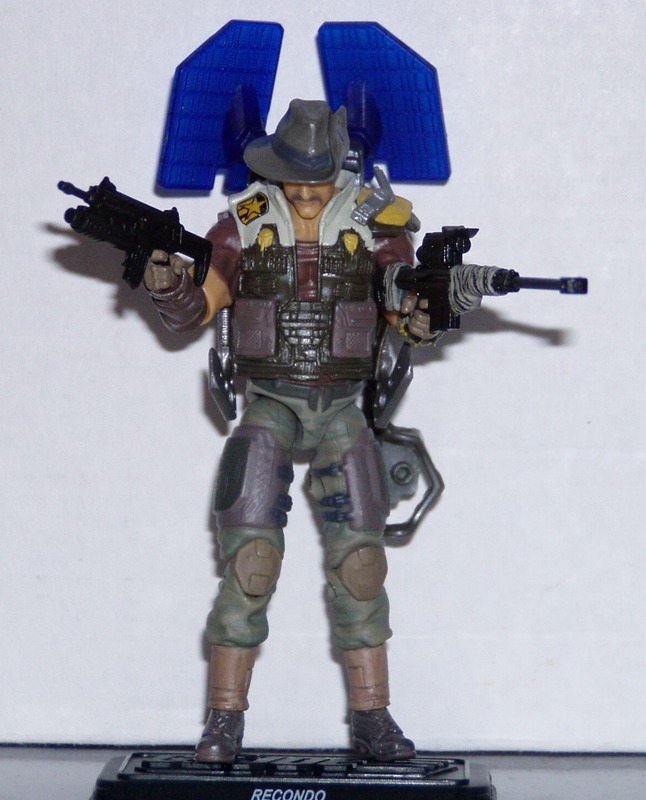 I understand wanting to update Recondo’s look but unlike the updated Duke and Beachhead from Pursuit of Cobra, I just don’t get a Recondo vibe from him. 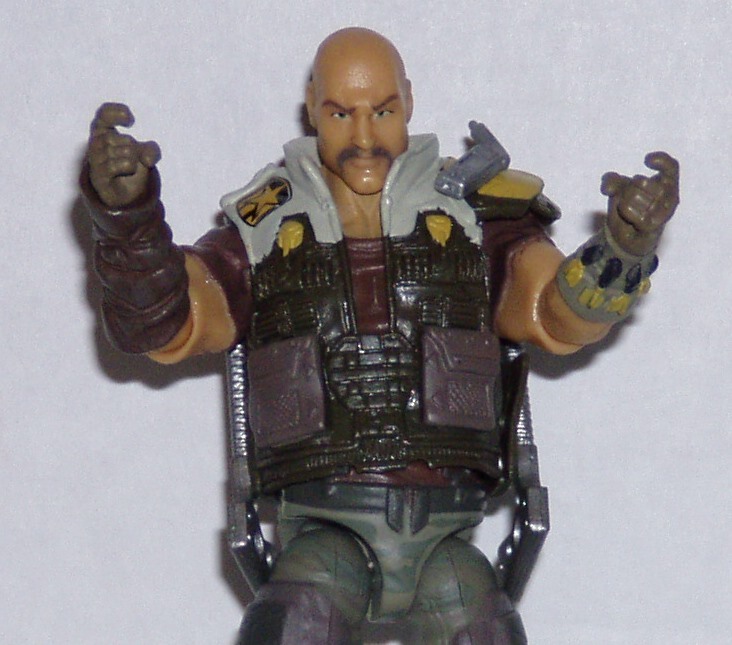 I realize I just finished singing the praises of Recondo’s look being updated, but in the head sculpt, there’s nothing really Recondo here. While I don’t agree with those that posit he was meant to be Gung-Ho, I still agree that he’s a big bigger step away from Recondo than I was expecting. It does, however, lend a bit of credence to the other Internet theory (backed up by some Hasbro design team hints) that the Jungle Assault team was supposed to reference the movie Predator. I definitely get a Jesse Ventura vibe from it, and I’m okay with that. It’s great that they based a really good jungle team on a jungle team from a pretty classic 80s action movie. However, I still do find it a bit jarring that I don’t really get that much of a Recondo feeling from the updated Recondo’s face. Recondo’s paint scheme is a little bit of a departure from your standard jungle trooper, but it still works very well for him here. Recondo’s legs are a light green with just a hint of darker green for a jungle camouflage scheme. His kneepads, thigh guards and boots are all brown which also fits with a jungle trooper. The pads also have black trim for the straps that hold them to his legs as well as the upper layer of padding. It comes together nicely as a look. Recondo’s shirt is almost a maroon color and while it’s not a color that I would normally associate with jungle fighting, it does work well with the greens and browns so I’m not going to give it any grief. The painting on the shirt sleeves is a little shoddy. There’s a bit of slop off the sleeves and on his forearms on the inner arms. It’s not bad, but it’s there. The wrap on Recondo’s right arm is a matching color and makes me wonder if Recondo’s shirt might have had longer sleeves before he needed to cut them down in the field. His other arm wrap is a rather pale green, close to the color of his pants. The darts are also painted black and yellow and they stand out really well against the arm wrap. Recondo’s vest also gets a lot of attention from the paint team. Its base color is a darker brown with the same brown as his thigh pads for his pockets and some white and yellow trim. These colors really work well together and it definitely gets across the point that Recondo is a jungle trooper while at the same time not falling into the trap of being just a little too generic. Recondo’s also rocking a bit of a tan and I’m fine with that. While the jungle canopy would provide some cover from the sun, considering how much time Recondo usually spends out on missions in the field, it makes sense he’d pick up a bit of a tan while on a long-term mission. 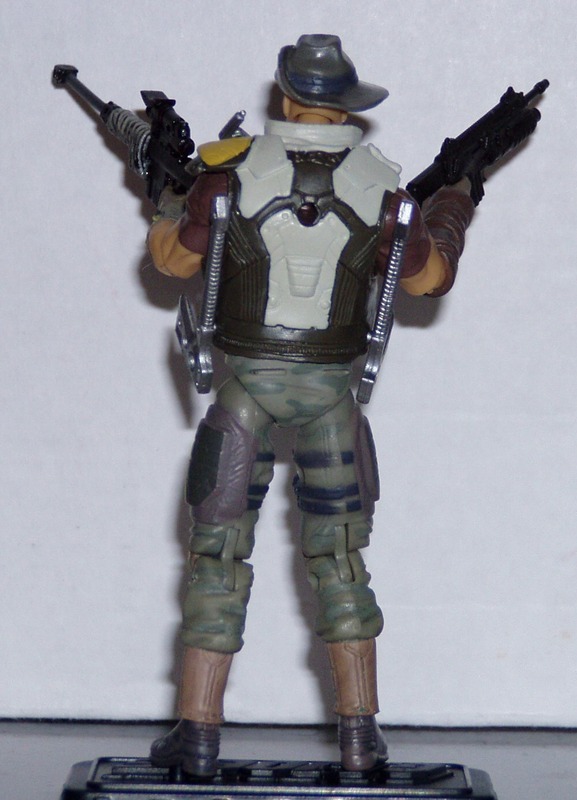 Like most Pursuit of Cobra figures, where Recondo really gets to shine is in his gear. Starting off small, Recondo gets to wear his signature hat. I’ll admit, the hat really helps sell him as Recondo. If he’s not wearing his hat, he could be any bald, mustachioed jungle specialist, but that slouch hat has always been associated with Recondo. It also gets a little attention from the paint team. It’s molded in a dark gray, but his hat band gets painted dark blue. The paint is a little shoddy on it, but it’s not bad. He also gets another head accessory, a tiki mask. While I’m not sure what purpose it serves, I do have to admit, they designed it rather well. It fits quite snugly on his head while not causing paint wear that can happen with masks like that. 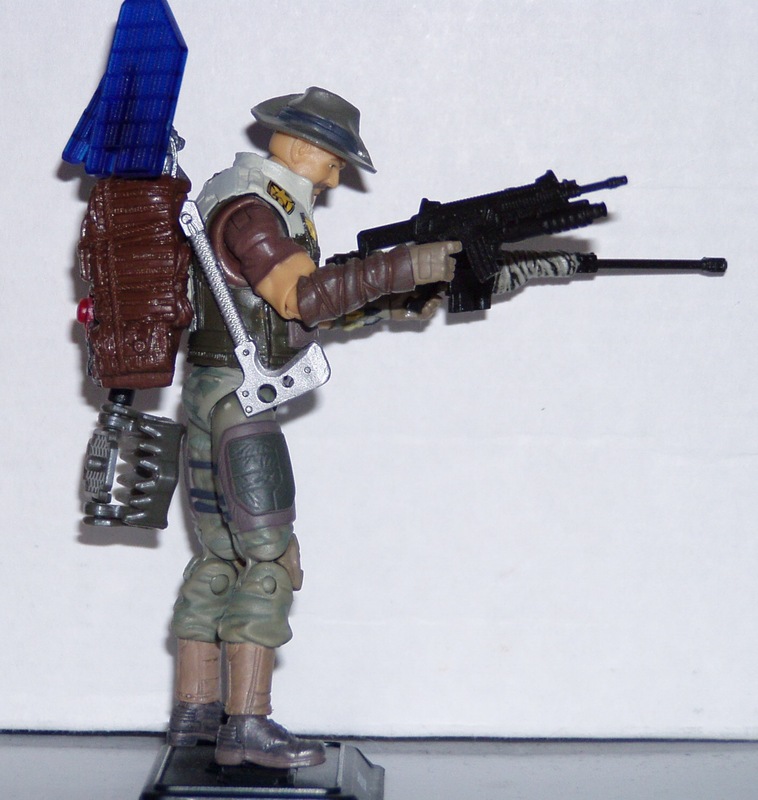 Like Pursuit of Cobra Snow Job, Recondo comes with a rather impressive backpack. 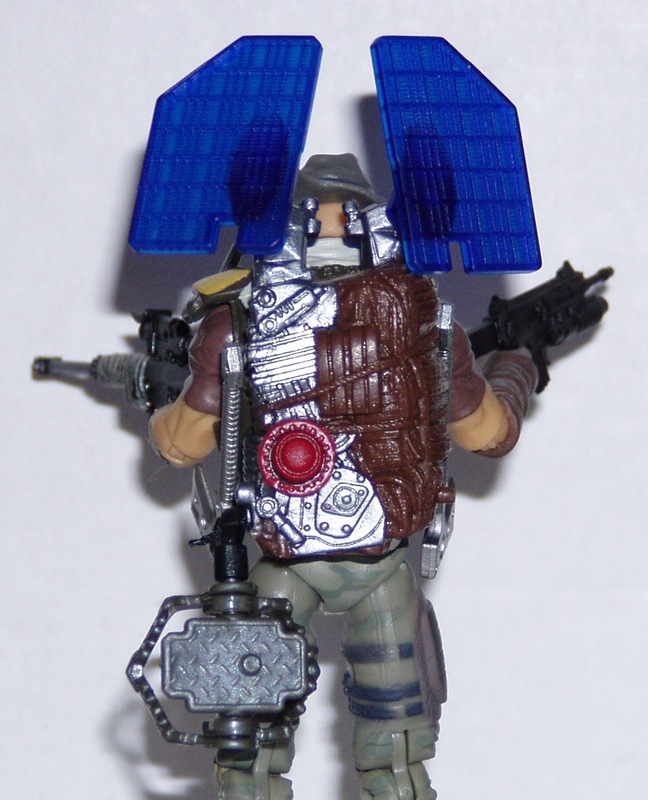 Recondo is carrying plenty of gear and what I really like are the solar panels. His backpack comes with a power supply to keep his various gear charged while in the field for a long time. It may not be an ideal power source in the jungle due to the thick canopy cover, but it’s definitely better than having to lug around a bunch of batteries. Recondo’s backpack also has a built-in action feature. There’s a small string that can be pulled away from the body of the backpack and if you press the red button, it will retract. The string can be attached to Recondo’s foothold traps. I’ll admit, the foot traps are an accessory I’m a little torn with. They’re great and really well-designed. They’ve got a footpeg for an unsuspecting Cobra Trooper to step into and when they step down into the jaws close around the figure’s leg. It’s a really great and functional design, but there’s just a small element of twistedness in this gear. I mean, Recondo’s carrying around bear traps for people. I’m not sure if I’m okay with that. The ethical implications are pretty brutal. Recondo lays them out, waits for a Cobra Trooper to trigger it and draw them and then comes in for the kill? I just can’t really figure out the purpose behind this accessory. It seems like something that would belong more with Shadow Tracker or a sadistic Range Viper more than a good guy like Recondo. 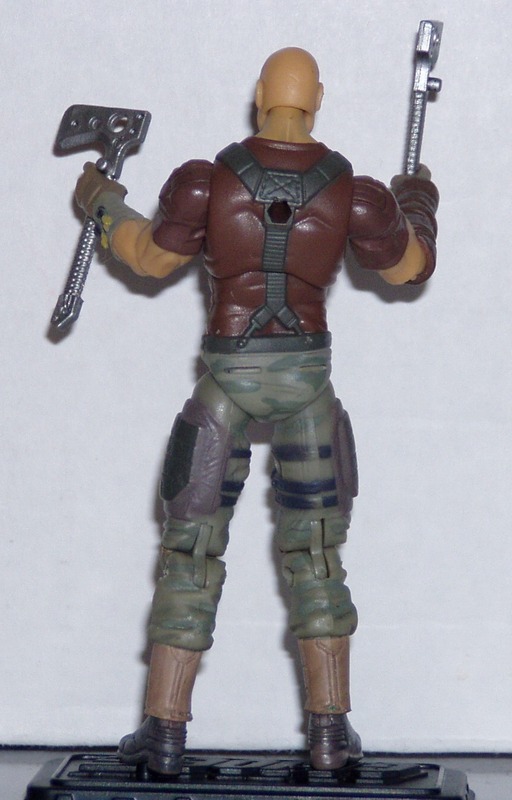 Recondo comes with a pair of axes that can be plugged into his vest so he can carry them while not in use. They look like those modern survival axes you see for sale in sporting goods catalogue. 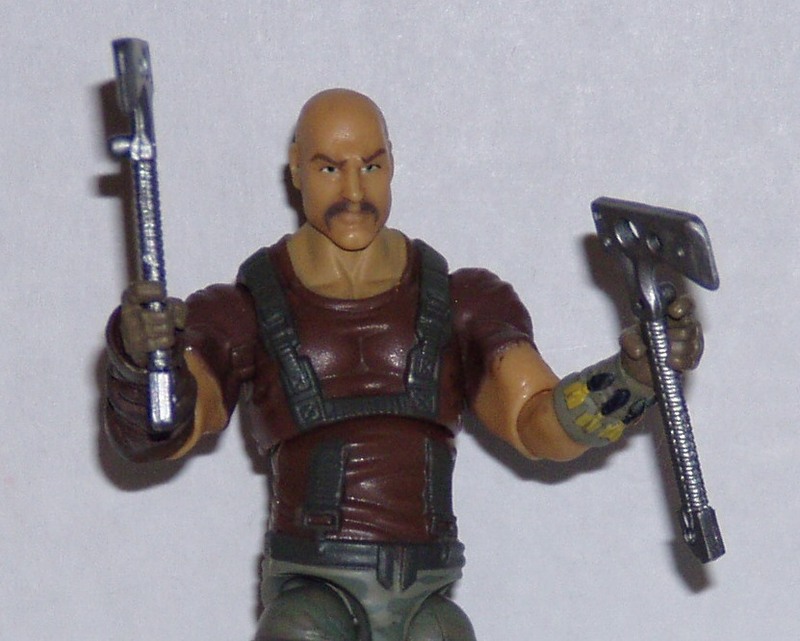 I’ll admit, it would be nice if Recondo had a machete, but the two axes work pretty well. Plus, they can be stored on his body. I’ve said it before, and I’ll say it again, but I love when figures can carry all their gear on them. 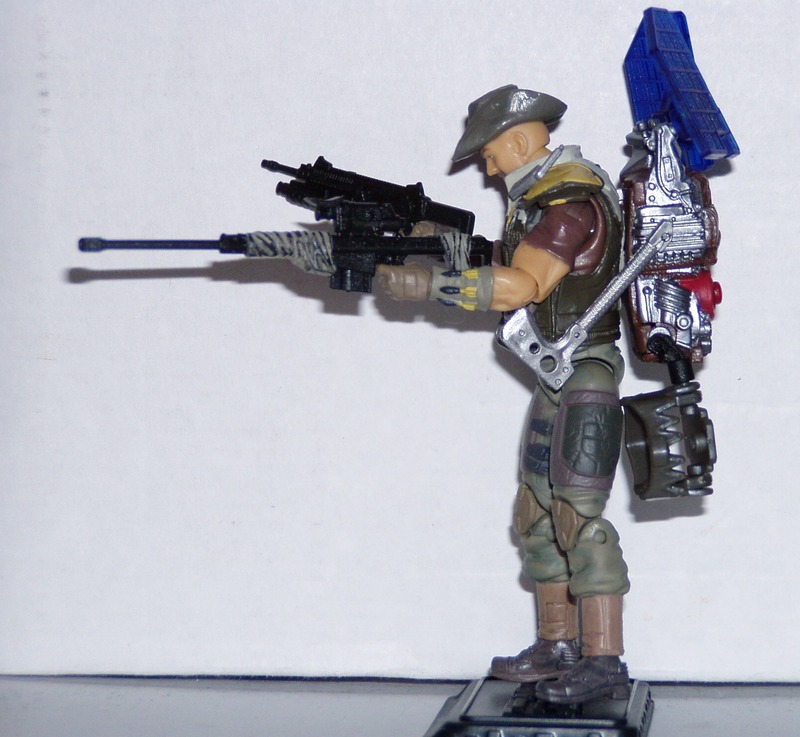 Recondo has a pair of rifles, each for a different purpose. Recondo wouldn’t be Recondo without a wrapped sniper rifle. It’s a great design but it’s also a nice throwback to Recondo’s original weapon. It’s a great reference without being the exact same, somewhat dated, rifle. For a little closer combat, he’s got a modified assault rifle with an underslung grenade launcher. It looks modern without being overly realistic or overly futuristic. Recondo can lay down some cover fire while withdrawing from his position with the rest of the Joe jungle squad. Jungle Assault Recondo is a great update of Recondo. While he does have the glaring flaw of the really bad neck-hunch, you can still accommodate for it if you know it’s there. To be honest, I never really noticed it until I was reading reviews because Recondo was up on a shelf above my eye level. From my vantage point, Recondo’s downward gaze wasn’t that bad. Currently, he’s on display manning the back gun of my VAMP Mark II. That’s another situation where having him looking a bit down at least makes a degree of sense. Despite his one glaring problem, he still comes together very well as a figure and while I would have liked to see a little more classic Recondo in his head sculpt, he’s still a very good modern representation of the Joe team’s most iconic jungle specialist. His neck has a big problem. Wow that head is crazy! Nice figure but it’s not Recondo. I think I’ll call him Tracker when I finally get him. Has no-one posted a fix for that neck?